When it comes to free image editing software, GIMP is often said as being the way to go. But it comes with an interface which can be a pain, despite a powerful engine. Then, Paint.NET comes to mind. Even if it comes with less features and extensibility, Paint.NET comes with a much more user-friendly interface, perfectly ergonomic, clear and unobtrusive. All features are immediately available without any hassle. This software offers all necessary tools to cover most basic image editing needs: paintbrush, pencing, paint filling, multiple selection shapes, layers, filters, effects... without reaching GIMP's much higher feature level. A lot of people know how to use the famous "PrintScreen" key to make screenshots. But do they really know that pasting it into external software isn't really necessary? 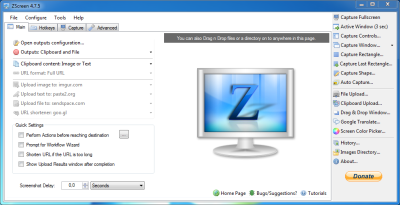 ZScreen can automatically handle this process when triggered from a given hotkey (including PrintScreen, obviously) to save the screenshot in a given image file (PNG, JPG...), avoiding the use of an external software (image editor, office suite) to save it. As a result, batch screenshots are much easier to achieve, either by pressing a key multiple times, or through a given hotkey for automated regular screenshots. ZScreen also comes with some additional features, and can also grab some given elements (text, pictures...) to send them on content sharing websites such as ImageShack. 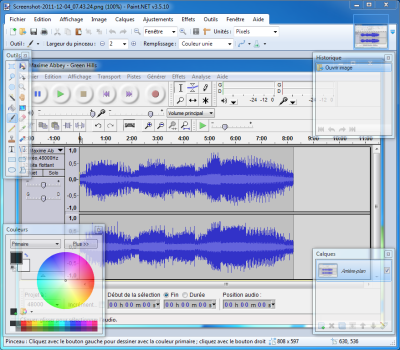 A quite useful piece of software, well-designed and often updated, but with some occasional glitches and crashes.